My beauty "Nemo" availible for purchase on Etsy! Just want to share some photos of my new girls from the Doll Salon exhibition in Moscow. Wow!!! The detail is amazing...right down to her feet. pianissimo tanoy13 thank you a lot! Very beautiful porcelain art! The fingers are fabulous! that is some super dainty detailing on her sculpt - well done, I really like her. 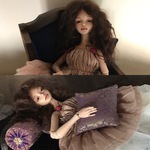 My new doll available for purchase! Sandra, resin, 40 cm tall. Materials: porcelain parian, china paints, mohair. There are 1016 leather fish scales made by hands.